Of all the countless great and wonderful objects thathave been imaged by the Hubble Space Telescope during its first 20 years ofoperation, we thought it might be interesting to find some Hubble objects thatcan be seen from Earth ? either with the unaided eye or employing a smalltelescope. In its very first year of operation, the Hubble capturedan exceedingly rare event: A major storm on Saturn, dubbed, the Great WhiteSpot. It turned out to be a fantastic system of swirling clouds and eddies. Theimage was taken on Nov. 9, 1990 and depicts what may arguably have been thegreatest atmospheric feature in the solar system. Nobody had dreamed that they would see anything as spectacular as what appearedon NASA?s television monitors when the first images of the storm from Hubblebegan arriving. After computer processing to remove the blurring effects of itsflawedprimary mirror, the images revealed a white-spot disturbance 200,000 mileslong and 6,000 miles wide. ?I came apart at the seams,? said James A. Westphal,who was then principal investigator for HST?s wide-field and planetary camera. ?My colleagues ribbed me, saying ?Westphal, that?sJupiter and you?ve put rings around it." How to find Saturn:This week, at darkness falls at around 9:00 p.m. local daylight time you canfind Saturn about halfway up in the southeast sky and positioned roughly midwaybetween the 1st-magnitude stars Regulus in Leo and Spica in Virgo. Saturn, shining with a sedateyellowish-white glow at magnitude +0.7, is brighter than either of these stars. It will be due south at around 10:30 p.m. and doesn?t setin the west until after 4:30 a.m. The rings are visible with a telescopemagnifying at least 30-power and they are currently tipped only about 2-degreesto our line of sight. The planet Jupiter made headlines again in mid-July 2009when a dark ?blemish? near Jupiter?s south pole wassighted by Australian amateur astronomer Anthony Wesley from his backyardobservatory. Slowly, as Jupiter?s rotation turned the blemish toward Earth,Wesley got a better view of it and he realized that what he was looking at wasa Jupitercomet impact. Soon, observers from around the world confirmed Wesley?s observation and proveda tempting enough target for scientists to put a hold on testing out therevamped Hubble Space Telescope and use its newly installed WFC-3 camera tocapture an image of the rare event. The Hubble image shows lumpiness to thedebris plume caused by turbulence in Jupiter?s atmosphere. ?It was important for Hubble to get an early look,? saidHubble spokesman Ray Villard. How to find Jupiter:This week it shines low in the east-southeast as morning twilightstrengthens. At magnitude -2.1, it?s unmistakable, shining with abrilliant silver-white luster. By the last week of May Jupiter should provide afairly good telescopic view, being at least 20-degrees up in the southeastduring morning twilight (for observers at mid-northern latitudes). By laterthis summer it will be in fine position for observation for most of the night. The AndromedaGalaxy is dimly visible to the unaided eye as an elongated patch of hazylight. At a distance of 2.5 million light years, it is one of the farthestobjects visible to the naked eye, and can be seen even from urban areas withbinoculars. In 1991 astronomer, Tod R. Lauer used the Wide Fieldand Planetary Camera (WFPC), then onboard the Hubble Space Telescope, to imageAndromeda's inner nucleus. The nucleus was found to be double, consisting oftwo concentrations separated by nearly 5 light years. The brighterconcentration is offset from the center of the galaxy. The dimmer concentration, falls at the true center of the galaxy. Canadianastrophysicist Scott Tremaine has proposed that thedouble nucleus is the result of the brighter concentration representing theprojection of a disk of stars in an eccentric orbit around a black hole at thegalaxy?s central core. How to find the Andromeda Galaxy:This week, the Galaxy is visible in the predawn sky low in the northeast. Ifyou don?t care to arise so early you?ll have a good view of Andromeda duringevening hours from the end of July to mid March. First locate the Great Squareof Pegasus, focusing binoculars on the star in the upper left corner of theSquare (Alpheratz). Run straight across and get thestar Mirach in your field of view. Then run slowly?up? to a fairly bright star above Mirach. Just abovethat star you?ll see a hazy patch of light. Because Earth and Marsfollow elliptical orbits around the sun, Mars's closest approach to Earthusually occurs several days before or after opposition ? when it appearsdirectly opposite to the Sun. On Aug. 27, 2003, at 5:51 a.m. EDT, Marscame within 34,646,420 miles (55,757,930 km) of Earth at 5:51 a.m., which isjust about as close as it can possibly come. At that moment, the Earth-Mars distancewas the smallest in nearly 60,000 years. It would have taken a light beam 3minutes and 6 seconds to cross the interplanetary gulf between Earth and Mars.Opposition came the following day. The next opposition bringing Mars evencloser will not occur until Aug. 29, 2287. This image was made withinminutes of the closest approach. How to find Mars: Nowwell up in the southern sky at dusk; Mars sets between midnight and dawn. AsMars recedes from the Earth, it continues to diminish in brightness. Currentlyit?s a fading golden-orange ember at magnitude +0.7. During the latter part ofMay it forms an increasingly eye-catching pattern with the nearby bright starsof Leo's star-shaggy head and chest. In fact, Mars will team up with the bluish1st-magnitude star Regulus for a strikingly closeconjunction on June 7. 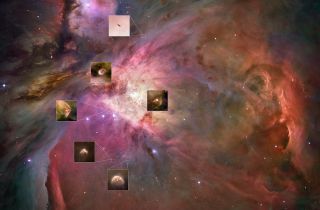 Within the brilliant constellation of Orion, the Hunteris a stellar incubator: The Great OrionNebula. A sort of auroral glow is induced in thisnebula by fluorescence from the strong ultraviolet radiation of four hot starsentangled within it. The Great Orion Nebula is a vast cloud of extremelytenuous glowing gas and dust, approximately 1,600 light years away and about 30light years across (or more than 20,000 times the diameter of the entire SolarSystem). Astrophysicists now believe that this nebulous stuff is a stellarincubator; the primeval chaos from which star formation is presently underway. How to find the Orion Nebula:You?ll have to look quick this week, for Orion ? primarily a winterconstellation ? is now dropping rapidly down into the western sky atdusk. Once you locate his familiar three star belt look immediately belowthe belt for a fainter trio which marks Orion?s sword. It appears to surroundthe middle star of the three. To the naked eye it appears not as a point oflight like a star, but as a diffuse spot that is dim, but unmistakable. It isresolved in good binoculars and small telescopes as a bright gray-green mistenveloping the star. In larger telescopes it appears as a great glowingirregular cloud. This was the first item on Charles Messier'slist of fuzzy objects. Messier was an 18th century comet hunter who compiled alist of nuisances that he did not want to confuse with comets. M1 (for Messier1) in Taurus has been taken for a comet by others using small telescopes, butwe know it as the CrabNebula. This cloud began its existence in a tremendous explosionrecorded by observers in the Orient and our Desert Southwest on July 4, 1054. Althoughit's 6,500 light-years away, this dazzling supernova was visible in the daytimefor weeks, and at night for two years. The gas cloud, now called a supernovaremnant, is still expanding and emits radio waves as well as light. How to find the Crab Nebula: Itis located between the two stars marking the tips of the horns of Taurus, thebull. A word of caution: you should have access to a dark, clear sky, for atmagnitude +8.4, the Crab unfortunately has a tendency to get lost in thebackground illumination in light polluted locations. It may be just barelyvisible as a dim patch of light in good binoculars. It is more readily detectable in a 3-inch telescope andbegins to appear as irregularly oval-shaped with telescopes of 6-inch apertureor greater. Unfortunately, Taurus is now quite low in the west-northwest rightafter sunset and will soon disappear from our evening sky. It will begin toreappear low in east-northeast before sunrise in July; by September Taurus isnearly overhead at dawn and will be readily visible during convenient eveninghours during the fall and winter months. A collection of stars numbering over 100,000, it is oneof the brightest globular star clusters in the northern sky. At a distance of25,000 light-years, and over 12 billion years old, the cluster?s stars crowdinto a region 150 light-years in diameter. Near the core of this cluster, thedensity of stars is about a hundred times greater than the density in theneighborhood of our sun. How to find the Great Cluster? Therather dim constellation of Hercules is low in the northeast sky at dusk, butstands almost directly overhead by around 4 a.m. Looktoward the four stars, known as the ?Keystone? which supposedly forms the bodyof Hercules. A keystone is the stone atop an arch, and has this shape,narrower at one end. It?s between the two western stars of the keystone that wecan find the GreatGlobular Cluster of Hercules. It?s about a third of the way along a linedrawn from the stars Eta to Zeta. Edmund Halley (of comet fame), firstmentioned it in 1715, having discovered it the previous year: ?This isbut a little Patch,? he wrote, ?but it shows itself to the naked eye, when thesky is serene and the Moon absent.? Never visible from large cities with their lights, smokeand haze, the beautiful Milky Way can still be readily viewed from distantsuburbs and rural locations. Before the invention of the telescope, the truenature of the Milky Way Galaxy (?Gala? is Greek for milk) was a mystery. Binoculars and telescopes reveal that the galaxy consistsof dense clouds of individual stars. For observers in the Northern Hemisphere,the brightest part of the Milky Way is in the constellation Sagittarius, nearthe star El Nasl. Astronomers believe that thisregion marks the ?hub? or central condensation of our own galaxy. The Sagittarius StarCloud, about 30,000 light-years distant, seems to be the nucleus, with thesun and all the outer stars of the outer stars of the galaxy turning at therate of 155 miles per second and apparently requiring 200 million of ourEarthly years to make one complete revolution, or one ?cosmic year.? How to find the Sagittarius Star Cloud:Sagittarius, which depending on how you look at it, resembles either a Teapotor an upturned dipper, used presumably to dip up the Milky Way. In late April,Sagittarius can be found low in the southeast around 3 or 4 a.m. local time. Bydawn it is nearly due south. Sagittarius is primarily a summer star pattern,which is when you can also find it in the southern sky before midnight duringJuly and August. The Ring Nebula is the most famous and among thebrightest examples of what astronomers refer to as ?planetary? nebulae. It?slikely a ring of bright material surrounding its central star. It is generallybelieved that sometime in the distant past, a star nearing the end of its lifeand having used up all of its nuclear fuel hurled great masses of gas out intospace in a gaseous shell. This surrounding gas is still expanding and is madevisible by the illumination from its extremely hot central star (which ismerely the core left from the original star). The surface temperature of thestar has been estimated at 216,000-degrees F (120,000-degrees C). Our own sunis expected to undergo a similar process in a few billion years. How to find the Ring Nebula:It?s located in the small constellation of Lyra, thelyre, which this week is low in the northeast sky before midnight and ispractically overhead at dawn. The ring can be located between the stars Sheliak and Gamma and shines at magnitude +8.8, and thus isfar too faint to be seen with the unaided eye. Any good pair of binoculars will locate it, though thering shape only becomes clearly evident to most eyes using a 6-inchtelescope. With larger instruments and higher magnifications, the ringappears distinctly as a ?tiny ghostly doughnut.? Ceres is the smallest identified dwarf planet in theSolar System and the only one in the asteroid belt. It was discovered onJan. 1 1801, by Giuseppe Piazzi and for half a century it was classified as theeighth planet. With a diameter of about 590 mi (950 km), Ceres is by far the largest and mostmassive body in the asteroid belt, and contains almost a third of the belt'stotal mass. Hubblephotographed Ceres over a 2-hour and 20-minute span, the time it takes theTexas-sized object to complete one quarter of a rotation. One day onCeres lasts 9 hours. Hubble snapped 267 images of Ceres from Dec. 2003 throughJan. 2004 as it made more than one rotation. Astronomers confirmed that Ceres has a nearly round body like Earth's. Ceres'shape suggests that its interior is layered like those of terrestrial planetssuch as Earth, and may have a rocky inner core, an icy mantle, and a thin,dusty outer crust inferred from its density and rotation rate. The bright spotthat appears in each image is a mystery. It is brighter than its surroundings.Yet it is still very dark, reflecting only a small portion of the sunlight thatshines on it. How to spot Ceres: Barely beyond the threshold of naked eye visibility, it can be seen withgood binoculars or a small telescope. For the next few months we mustsearch for it amid a rich background of the star clouds, clusters, and nebulaeof the Sagittarius Milky Way. Around June 1, Ceres will appear totraverse the famous Lagoon Nebula. It will arrive at opposition on Jun. 18,shining like a 7th magnitude star at a distance of 69 million mi (274 millionkm).